Best Cai Luong artist: Thanh Ngan with 37542 votes. She won this awards two times in a row. Best female singer: My Tam with 18,164 votes, this is her third time receiving this award. Best male singer: Dam Vinh Hung with 9945 votes. He was not present to receive the award. Besides, HTV also randomly awarded male singer Quang Dung as Mr. Congeniality for his musical contributions to the station and other social works. A few memorable moments from the award show this past April 5th. Tuan Hung and Thanh Hang announce the nominees. Thanh Hang (R) & Ngoc Oanh (L) announce Nguyet Anh as Best supporting actress. Ngo Thanh Van and Thanh Ha announce nominees for Favorite Male Actor. 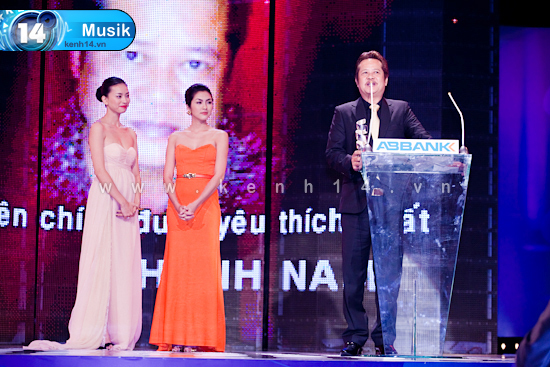 Ngan Khanh received Best Actress award announced by super model Ha Anh and Tien Doan. Hong Nhung award My Tam as Favorite Female Singer. Singer Dam Vinh Hung was on tour in Europe and therefore could not personally accept his Favorite Male award . Quang Dung is surprised at winning “Most Friendly Singer”. Thuy Nga is ecstatic about her award. Thuy Nga totally deserve the award! she’s so funny !!! It’s 5 days old so what? they are trying their best to update the news and they volunteer to do this not like this is what they’re living on! Stop commenting about how old the news is, please!